We inform you that the personal details that you give will be collected in PRIMAVERA SOUND S.L files and will be used to manage your order, the ticket, purchase and/or relationship. You can exercise your rights of access, rectification, cancellation and opposition to use of your details at the email address lopd@primaverasound.com or at the following address C/ Àlaba, 140 - 146, 2º 4ª, 08018 Barcelona. Thanks for subscribing to our newsletter. 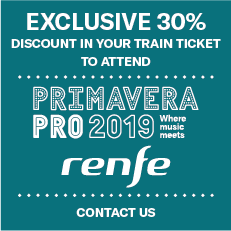 You will shortly receive an email with the latest news about PrimaverPro. 230 €: From 8th January until 85% of tickets have been sold. 250 €: Once the 85% of the capacity is sold. With reduced price for previous years attendees: write us.